Microsoft has provided many adventurous games as Windows 8 apps for kids to improve their skills in educational adventurous games. It was only yesterday that I want browsing around and found one amazing app for Windows 8. Let me introduce the same with you, as well. Kikoriki is a free arcade type adventurous game app for Windows 8 users that let your kids watch animated stories and play adventurous game right at your Windows 8 desktop. Offers the video of real cartoon characters. Offers the brief description of each cartoon character under About category. Offers nice and beautiful wallpapers. You can even set them as a desktop wallpapers. Your hired cartoons video will be mention under My cartoons category. 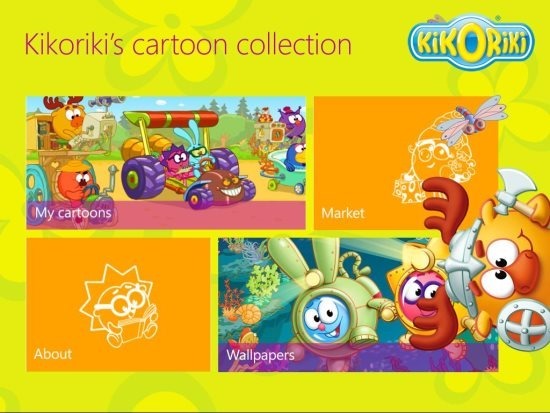 Windows 8 Kikoriki App comes up with four different categories such as My cartoons, Market, About, and Wallpapers. You will find a brief description of each cartoon character if you go onto the “About” option. with a single click on their pictures. You will find the beautiful and nice wallpapers belongs to cartoon character under Wallpaper category and you can even set the wallpapers as desktop background from picture library as saved in it. You can watch the stories of different cartoon characters such as Smiles of fortune, prince for Rosa, the forgotten tale, the past year tale and the like after purchasing at free price from Market category. After purchasing the video of real cartoon player, it will be mention under My cartoons category. Also, check out our post on Video Recipe App for Windows 8. Kikoriki App is a nice a Windows 8 game app especially prepared for those ho loves to watch the videos of cartoons character. Try this app available under Entertainment category within Windows 8 App Store.